Upon my return from the Gandhi 3.0 retreat in January, I remember standing at Dubai airport and asking universe to find me a pure space like Sughad in Dubai that allows me to stay connected to the land (what seemed an impossible ask but after Gandhi 3.0 I knew anything was possible) and then I forgot about it. Over the next few weeks I got caught up with the idea of launching Tafadalu Cafe (Emirati version of Karma Kitchen). And on the day that I went to Red Crescent to get a volunteer license I was redirected to another project. During my third hour at the Red Crescent office, I met a lovely Emirati lady Shadia who used to be a journalist and left her job to set up Al Rawafed Learning and Development Center- a center for displaced children from Syria who have sought refuge in Dubai with their families to help them catch up on the 3 or 4 years they have missed at school so they can enter the regular public school system. The children live with their families in Ajman and their fathers are either unemployed or truck drivers. I had no idea that we had a community of displaced Syrians here until meeting Shadia! Shadia asked me what I do and I told her a little bit about The Kindness Institute and she invited me upstairs to the 2nd floor of the Emirates Red Crescent building in Dubai. There was a magical science room, a room dedicated to English and a room dedicated to Arabic. They have a small library and a few computers. The center struggles to survive due to lack of funding but Shadia perseveres. I met a friend of hers who is a psychologist who volunteers her time and expertise at the center. Shadia and I had a beautiful conversation about letting go and surfing with the universe and she shared how each time she had no idea how she would move forward God always had a plan for her. 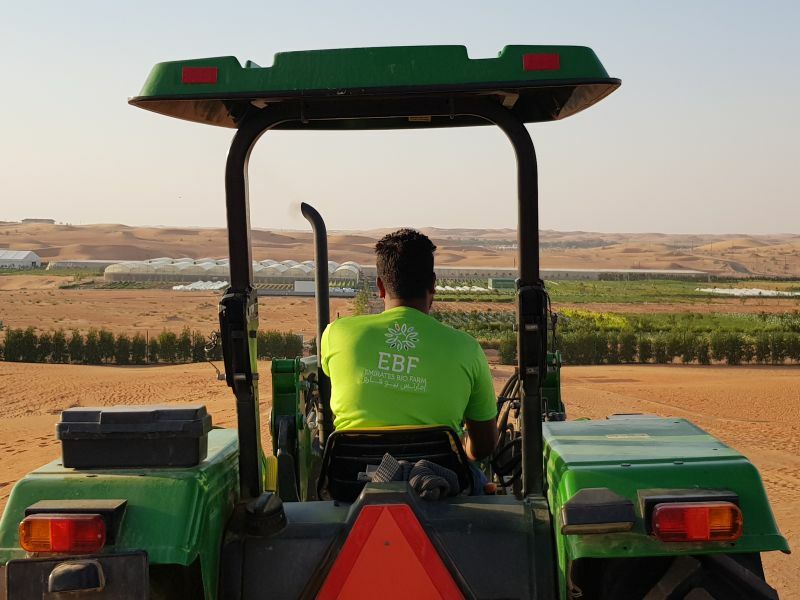 A few days later via an instagram ad, the universe took me an hour out of the city to a two year old organic farm in the middle of the desert called Emirates Bio Farm, EBF. The farm was stunning and sits on a kilometer by kilometer plot surrounded by sand dunes. Everything is natural, organized and clean. The farm is 100 percent organic and there is a profound respect for the land and environment. They use the neem plant as a pesticide. They also co-plant - insects typically don't typically jump from one plant type to another due to different immunity levels. They use double sided sticky paper as a fly traps and the manure of the 7000 free range chickens on the farm is use to fertilize the sand. The plants live off of the sweet water aquifer that sits beneath the land. They compost and they send their customers ugly vegetables free of charge. I honestly have never seen happier vegetables. The eggplants are big and shiny and the onions are enormous. They have butter head lettuce, and romaine lettuce and porcelain, and water cress, and swiss chard, and copious amounts of betroot, potatoes, okra, corn, water melon, kale, quinoa and the list goes on and on. The chickens come from Germany because they are some of the few chickens in the world that still have an organ that digests vegetables and they are fed vegetables from the farm. The chicken laid their first four eggs three days ago and the plan is for EBF to supply the market with 5000 eggs a day. Danyal and I jumped on a lorry with about 15 people that was attached to a tractor and our tour guide Yazen (who's father started the farm) told us all about the farm. He took us into the fields where we harvested potatoes, onions and carrots! There is nothing more satisfying that gently twisting an onion out of the ground. Danyal was elated and so was I. After harvesting he took us up through the farm to the surrounding sand dunes where we enjoyed hanging out in a traditional tent, drank coffee and tea and looked out over the farm and into the big blue sky. I sat with Yazen's father for a while and he shared his personal story and his journey from Syria to the UAE in the 1970s and how he helped the founder of the UAE, Sheikh Zayed develop his first wheat farm for food security, and how his career in agriculture evolved from there. On the following weekend I returned with Sonia, Sara and Meredith who I had met the day before at our Stitch a Heart circle and who were excited to visit the farm and explore volunteering opportunities as well. We had the privilege of spending more time with Yahya, Yazen’s father. Yahya shared that he wants to write a book called The Fifth Power on making values and morality the fifth branch of government and that this branch would comprise of writers poets artists who would need to approve all government decisions. He said we are forgetting our values and morals in society and this is hurting the land and the nation. He even brought up Gandhi ji in the conversation. The abundance of the vegetables on the farm was beginning to make sense. Yahya shared a few stories about the Late Sheikh Zayed and his Highness’s love and respect for nature and how he would do surprise checks on his farms to make sure that none of the birds were harmed. He praised Sheikh Zayed for his efforts to make the UAE green by planting over a million trees, for insisting on planting short palm trees so laborers could easily reach the dates on the trees if they were hungry, on his love for birds and protecting them, and for his vision and determination to establish a farming industry in the desert to teach his people how to produce their food rather than buy it. He also spoke at length about Sheikh Zayed's kindness and generosity. That was six weeks ago and I have visited ever weekend since. 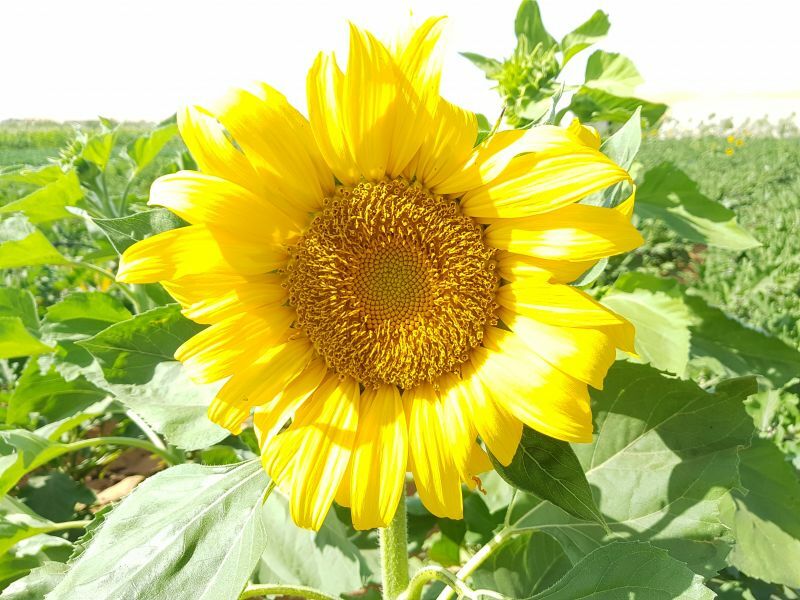 Yazen and I are now good friends and one of the things that has made us pals was a volunteer event he hosted with us where he opened the farm up to the 90 Syrian brothers and sisters from the Rawafad Developent Center run by Shadia (mentioned above). Just as I returned to Dubai Lejoy’s friend Vatche came to my house to collect smile cards and shared that he is originally Armenian but grew up in Syria, a week later I met Shadia who runs the center for the children from Syria, and that weekend I met Syrian father and son Yahya and Yazen who shared how Yahya sponsored a literature festival in Syria for years that has now stopped due to the war. The universe was calling for a connection to be made and so I did. After getting the green light from Yazen, I used my passion and excitement to get Shadia enrolled in the idea of bringing her kids up to the farm two hours away from where they live. Sonia used her event management and coordination skills to enroll Rana who runs a hula hooping company called Flow Ground to bring her hula hoops and expertise to teach the kids how to hula hoop on the dunes. Sonia also brought a bunch of Goodwill Tribe volunteers- Varyunya, Jubi, Vikita and Khushboo and she designed the flow of the entire event and assigned roles and responsibilities, Danyal's teachers Ms Hannah and Ms Huda from Kids Cottage Nursery made Free Hugs signs and the welcome poster and Danyal and his friends made posters dedicated to each of the vegetables growing on the farm, Yazen's friend Preeti who volunteers her time to run art pop ups called Sgt Pepper at his farm on Fridays said she would love to do something for the kids, and as the whatsapp group got formed, friends of friends began to join. Thanks to Yazen's best friend Mona (who works at UNHCR), ten volunteers came forward with their Arabic speaking skills, a youth group came up from Abu Dhabi led by lovely Samah to volunteer for the day, Sunita, Jacob and Faye helped lead groups, Aparna (who runs Clarion and Dubai Scholars schools) donated two buses to bring the kids to the farm and ten of her students- Annada, Nuha, Kashish, Raiaan, Husna, Adonai, Hafsai, Natalia, Reham, Murtuza, Nafisa, Anjum, Amber and their teacer Mr Raymond Barboza accompanied the kids from where they live in Ajman to the farm, three hours away! Tons of food was prepared by volunteers behind the scenes- Anar, Nof, Zareen, Nadia, Faye, Ayesha. We were expecting up to 70 children and Shadia said don't be surprised if you get 40 being a weekend and parents not being in the mood to drop their kids to the bus. We had 90 show up. The children were welcomed at the gate with free hugs signs, heart pins, and smiles and then divided up into five groups led by one Arabic speaking volunteer and an English speaking volunteer who was there for support. 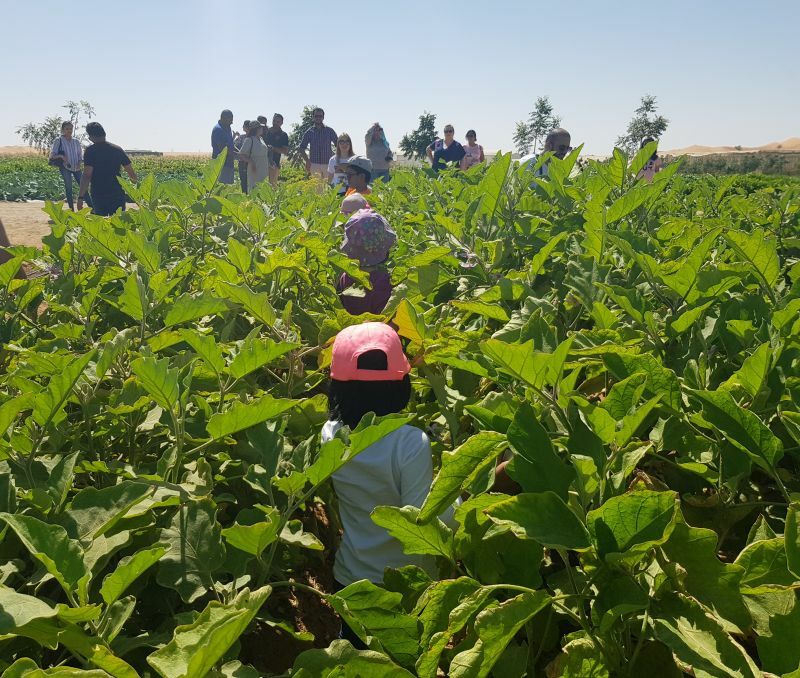 The children rotated between the art pop up where they made stamp art using carved potatoes and betroot, tractor ride plus harvesting on the farm led by Yazen in Arabic, hula hooping in the dunes, and a meditation circle with Faye at the green house. The food was entirely home made and included pigs in a blanket, meatballs, macaroni and cheese, hummus and bread. There were also ten chocolate cakes made from scratch made by a volunteer named Nadia who is a mother of four beautiful girls. x The buses were three hours late and not a single volunteer complained. Everyone was smiling, arranging the space, creating nametags, laughing and hanging out. x The heart pins were a hit! x This was Yazen's first time volunteering in the UAE and he was deeply moved and inspired - particularly after we did the closing circle at the end of the day with all the volunteers to reflect on what we were grateful for. Yazen was acknowledged for opening his farm to the kids and the volunteers and for graciously hosting everyone with an open heart. He was covered in heart stickers. heart pins and hugged repeatedly by the end of the day and he said it wasn't really his thing until he met us. Yazen is now beginning to meditate and he has developed a love for hugs. x Yazen is now entrusting Sehr to volunteer her time on weekends to lead tractor tours and harvesting experiences with visitors and he is excited about the prospect of developing a volunteer program on the farm. Yey! x We are now looking to help Shadia arrange lunch for the kids at the center. They require about 100 chicken mayo sandwiches a day, a pack of milk and juice. Members of the local community are coming together to make the sandwiches in their kitchen and sponsors are being approached for the juice packs and milk. x Rana from Flowground has offered to donate hula hoops to all the kids at the center. x Sehr was inducted as a volunteer at the farm during spring break where Yazen entrusted (with great difficulty - he couldn't understand how someone is not paid to show up will still show up) her to go out with several groups, which was a huge step forward towards promoting a culture of kindness at the farm. Several visitors have asked if they can volunteer and we are looking into exploring this further as well. x We also arranged a gong meditation session on Friday night under the full moon, which was beautiful, and Yazen is keen to develop part of the farm into a wellness center. xWe are now looking into decorating oil barrels with hearts and placing them throughout the farm to make sure visitors don't litter the farm and we are going to heart storm other ways to instill kindness towards the landin the visitors during their visit. xWe are also exploring ways to recycle plastic bottles, signage through out the farm, and creating a deeper and more meaningful experiences for visitors next season. 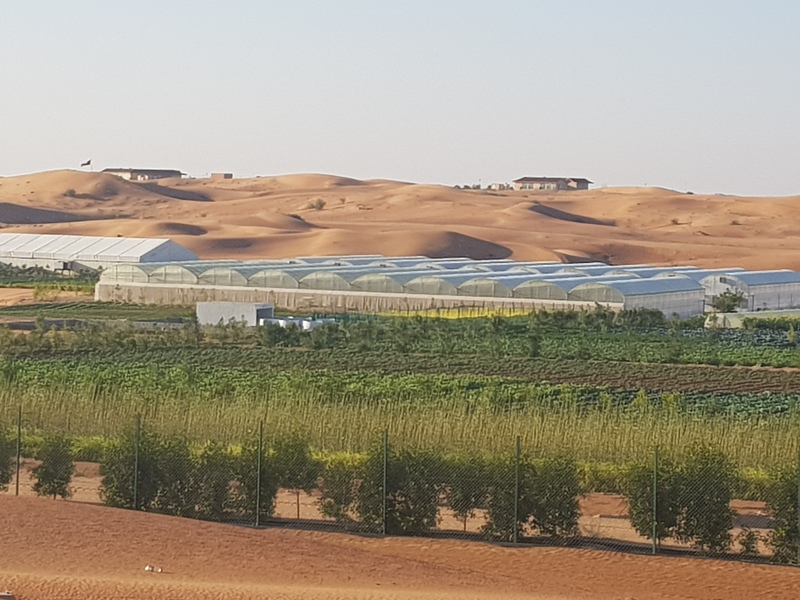 xYazen is also setting up a farm to table restaurant in a greenhouse that he is building as we speak and they have dug a dip in the sand to experiment with fruit trees which is not been done in the desert before. If any one has thoughts, ideas or inspirations on how to develop the farm towards a space dedicated towards promoting compassion and kindness please do get in touch! What a gift for the kids! Oh my goodness! I mean, oh your goodness! These stories are as rich, bountiful and happy as the vegetables! Especially love how Yazen how is a hugger :) And your promotion to being the first volunteer farm tour guide! Must have been such a meaningful experience for the Syrian children, with Arabic guides! Beautiful photo of Danyal <3 Dubai is on a roll! Thank you for taking the time to share, and to individually name all the volunteers! ah such a lovely time! thank you Sehr for your big heart and bringing magic to our city. Thank you so much for sharing and onwards to more heart connections!!! !